It’s October 2, the day after the usual season closing weekend, and I have just had another morning of fun spring snow. That comes after a couple of days of good winter powder on Saturday and Sunday morning, all the more remarkable as we had warm northwest winds and 60 mm of rain last Friday. Powder on the last day of September pretty well sums up this past winter and there is still a lot of snow up there, the average base on the top half of the mountain is well over a metre, and people will be touring the backcountry for another month. Although Falls Creek and Hotham shut on Sunday, Thredbo, Perisher and Buller have decided to keep lifts open for a few more days; Thredbo and Buller until Sunday 7 October and Perisher to Friday 5 October. The smaller resorts like Charlottes Pass and Baw Baw closed with plenty of snow on the ground and considering Perisher opened early for the winter way back on June 2, this has been the best season in a long, long, long time. 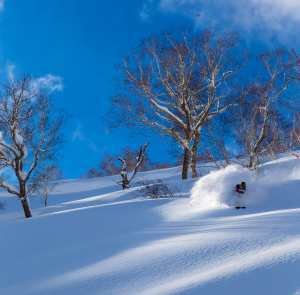 He’s right, quality and consistency are what this season was all about, with bugger all rain over four months, plenty of powder days and a cumulative snow fall total since mid-May of over four metres and most resorts hitting a 2 metre base by the end of August. It is interesting to note that way back in May the Grasshopper called for a peak depth of 201 cm as he felt this year would be similar to 2004, the last time we broke the two metre mark. It ended up peaking at 216.5 cm at Spencers Creek, and the Grasshopper was on the money all season. No wonder he is regarded as the best snow forecaster in the business. Anyway, the first decent snowfall hit on May 25 and that natural snowfall was backed up by some good snowmaking nights so all of the resorts had some decent terrain on offer for the traditional opening on the June long weekend. The snowmakers continued to have a good run in mid-June before the season swung into top gear when a solid storm arrived on June 21. This system dumped 30 to 45 cm of dry snow in three days, and the weekend of June 23/24 was the first of many memorable weekends. That storm set things up nicely for the school holidays with plenty of lifts and terrain open to handle the busiest three weeks of the year. While we didn’t get any solid storms in school holidays, we had dry cold weather for the first two weeks with a very good mid-winter snow cover. Naturally it has to rain at some stage during the school holidays and we had a few crappy days in the third week. Unfortunately those bad days coincided with the interschool races but fortunately the poor weather did no damage to the snow pack. 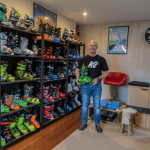 The last week of July was fine and cold, great snow with a couple of good wind-blown powder days, but given the quality of the snow and the time of year, it was surprisingly quiet – almost like September mid-week, and a worrying time for business owners. 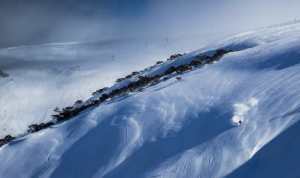 While the New South wales resorts, Hotham and falls had a very good base by late July, Buller had missed out on the brunt of the snow and was struggling. However, Mother Nature kicked things back into gear in August, with all of the resorts enjoying an outstanding month of snow. A solid storm hit on the first weekend of the month, with 15 cm by Monday 6 August and it was good to get some fresh tracks after a few weeks with only minimal snowfalls. However at this stage no one was anticipating the amazing pattern we’d see for the rest of August. 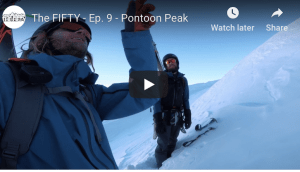 It was an amazing seven-day cycle; five weeks straight where we had moderate to strong winds on Wednesday and then a big fall of dry powder on the Thursday or Friday ahead of a fine weekend with perfect snow and weather. These storms were pretty amazing, solid amounts and high quality snow. 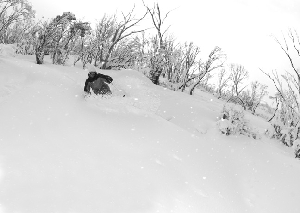 We had 15-40 cm on August 9 followed up by another 15 cm over the next couple of days and the base in the NSW resorts hit 165 cm. Another front was due around August 16 and while the computer models were calling for a big one, the Grasshopper had more modest interpretations. It ended up being one of the storms of the year, 20-40 cm overnight on the Thursday followed by another 25 cm on Friday 17 August. It was windy and cold and with the temp at -7, the afternoon of August 17 was one of the best days skiing I’ve ever had in Thredbo or anywhere else for that matter, boot deep powder to the village while some of the steeper lines up high were knee deep. It was Thredbo at its best with the Golf Course, the trees off Funnelweb, the Bluff and Snowgums etc all exceptional and it was snowing hard all arvo so every run was fresh tracks. Of course it was a similar story in all the other resorts and Bill Barker rated that day in Hotham as the best in three years. As I’ve written in earlier snow journals, the best day of the season was thrown out a lot this year, with each “best day” seeming better than the previous. August kept delivering with another 50 cm from August 30 – September 1, and I think Friday 31 August now has the consensus of the best day of the season. You’d think that would have been the closer, but another 20-30 cm fell on September 7/8 setting up the epic spring snow we’ve had the past three weeks. Round it out with another 15cms last weekend and everyone is pretty happy. Winter 2012 will go down as one of the best ever, but it makes me worry about 2013. We can’t get two in a row …can we? We’ll have to wait until the Grasshopper’s season preview next May.